Casino players are flocking to Royal Panda Casino. As the name suggests, the casino possesses a Royal Panda as its logo, with knowledge that the panda is adored the world over. A casino that rewards players’ loyalty, Royal Panda aims to provide a fun and entertaining service to its users where everyone can have a great time. A relatively new casino on the online market, Royal Panda was launched in 2014. Don’t let the novelty deceive you though – the website is of the highest quality, with plenty of added quirks and a full instant-play interface. Including Live Dealer games, the site reinforces its quality by the presence of the industry’s top software platforms; Microgaming, NetEnt and Rabcat. Available in a variety of languages the casino is licensed by the government of Malta and by the UK Gambling Commission. Using a hand-picked method to ensure the best possible casino experience for its players, Royal Panda mixes traditional table games – including Roulette, Blackjack and Baccarat – with innovative slots (both classic and video versions, with video slots the most popular amongst users). Royal Panda also offers a state-of-the-art Live Casino with real dealers for players to enjoy a realistic experience whilst playing virtually. In addition to playing on the computer, players can also access Royal Panda Casino on their smartphones or tablets using the app, thus allowing the opportunity to play their favourite games on the move. The casino also presents players with the chance to play for fun, thus being able to enjoy all their favourite games without having to risk their money. Microgaming and NetEnt are the primary software providers for Royal Panda, offering players 7 different varieties of poker. In the Live Casino, players can enjoy Live Dealer broadcasts from a professional television studio as well as a live stream broadcast in television quality so they don’t have to worry about missing any action. 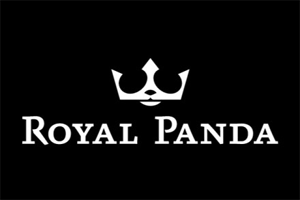 As mentioned above, Royal Panda rewards its users with the Loyal Panda program. Regardless of individual outcome, the casino offers players Loyal Panda points which can be exchanged for Free Spins, iPhones, laptops and other superb gifts in the Loyal Panda shop. Furthermore, the casino offers an introductory bonus upon first deposit of up to €100 for new users, in addition to 10 Free Spins on the popular slot machine game Starburst. The weekly Bamboo Bonus of up to €150 which is offered every Friday guarantees that players can enjoy themselves and get their weekend off to a good start. As is becoming the norm with online casinos, players can make deposits and withdrawals using a number of different methods. In addition to MasterCard, Visa, Maestro, Royal Panda offer 17 other payment methods, including Skrill, NETELLER and paysafecard. The casino uses an Extended Validation SSL certificate, offering players the most stringent level of authentication available in addition to encrypting user data and a strict information security policy, ensuring that user data is safe at all times. Royal Panda values customer queries highly and has a “Help” tag to the top right of the website. Upon clicking, users are presented with the answers to FAQs, a live chat where users can contact customer service. Furthermore, there is a support email helpline at support@royalpanda.com in addition to a customer helpline which is available at +356 2778 0418.